N-o matter what, God isalways there with open arms. and derring-do to the family. Iam Mary joy T. Pinay-an, 20of age. I was born in May 8,1990 at Pojnaan Aguinaldo Ifugao. My province is Ifugao where my parents hailed from. I got three brothers and two sisters and I am the middle among all the sibblings of six. My parents' names are Luisa Pinay-an and Lino Pinay-an. I have a happy family. I finish elementary when I was 12 of age, at Potia Elementary School. I graduated elementary in 2002 with an award. When I was in elementary, I got many friends. I joined the district meet and provincial meet when I was in grade five and six. I enjoyed playing at that time. I joined also the Star Scouts and Girl Scouts where I learned so many things and bravely took the challenges from these elementary extra-curricular activities. When I was in the secondary level in Ifugao State College of Agriculture and Forestry (ISCAF). I met more friends and had new batch of teachers and classmates. My friends and I loves playing ballgames. I joined district meet again when I was in first year. I remember when I was in second year high school, the name of my group as friends was Die Hard Gang. If anyone of us had problems, misunderstanding etc. we solve/face them altogether as a team. I enjoyed my studies when I was in high school. When I reached 3rd year, my mothertranfered me in other school because of my bad company and other person. I was so sad then because that was the end of our friendship. So when I was in 3rd year at Namillangan National High School (NNHS). The first day I was so shy because I know no friends in there. But after weeks/months, I met friends already.For me my high school life was the happiest moments. I graduated in the school year 2005-2006. I enrolled my college in ISCAF, year 2006-2007. My course was BSIT but sad to say I didn't finish it. This made my parents so angry. In November, 2006 my friends and I planned to go to Baguio for job hunting. In June 2007, I enrolled at GWCB, Eagle Crest Villa Bakakeng. In Bible School I learned more about Jesus Crist our Savior. I met faithful friiends who are always there top encourage, protect and comfort me when I am sad. 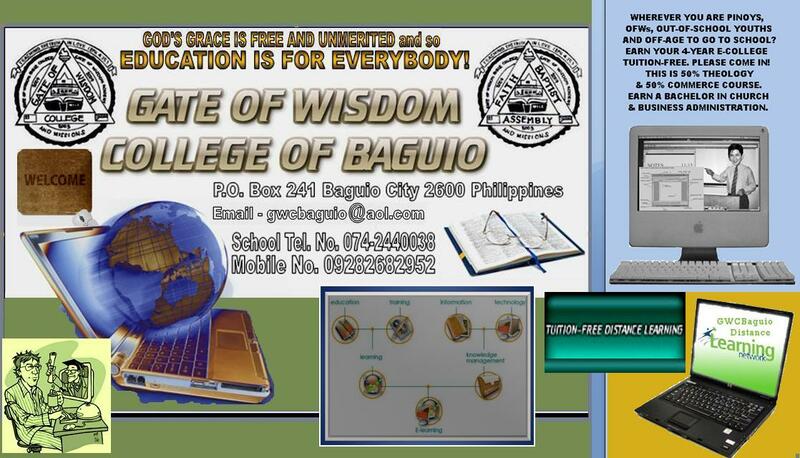 When I was in first year, here at Bible school I enjoyed my studies. I like the subjects, my teachers and my classmates. We are very happy to be with. until now, I'm still here studying. I am determined by the grace of God to finish my course, because I know that God is always there to help/guide me in my studies.